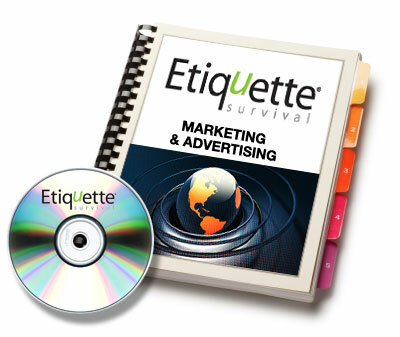 The Etiquette Survival Getting Started™ manual contains everything you need to promote, advertise and market your consulting business. You receive samples of sales letters, sample press release, client proposals, flyers, ads, and many additional resources. With the purchase of our Getting Stared manual you also receive our Etiquette Survival e-newsletter and a five year listing of your company profile on the Etiquette Survival “Find a Consultant in Your Area” page. Getting Started: Your Etiquette and Protocol Career Guide™ is comprised of 10 main steps. 7. Marketing & Advertising with Articles, Direct Mail, Blogs, Web Sites, Press Releases, Online, Social and Professional Media Sites. Includes one year mentor program membership! One-on-one phone and email consultations with etiquette Expert Sue Fox.